Community association boards control the purse strings of the communities they govern, and as such they have been long-standing targets of individuals seeking to defraud associations. A recent case involving the takeover of a number of Las Vegas HOAs in a scheme to steer large construction contracts to a Nevada general contractor appears to have set a new bar for the heights to which individuals will go in their efforts to defraud HOAs for contracts worth millions of dollars. The accounts of the Nevada case read as if they come directly from the pages of a novel about a wild and far-flung criminal enterprise, proving yet again the old adage that reality can be stranger than fiction. The U.S. Justice Department investigation revealed that 11 homeowners associations were defrauded of millions of dollars in the takeover scheme that took place from 2003 to 2009, and federal prosecutors are seeking jail time for the defendants in addition to approximately $25 million in restitution. The alleged mastermind behind the scheme has pleaded not guilty to conspiracy and fraud charges leveled against him and 10 others. Besides conspiring to commit mortgage fraud in order to secure mortgages for straw buyers in the communities, the defendants are accused of getting their straw buyers elected to the boards through bribery, ballot stuffing, intimidation and dirty tricks. Once on the board of the HOAs, these directors would secure lucrative construction contracts benefiting the organizers of the fraud. Accounts tell of co-conspirators travelling to Mexico to print phony ballots and counting ballots in co-conspirators’ offices, and one co-conspirator used his master key at a condominium complex to remove ballots from mailboxes. Other tactics involved “dumpster diving” efforts to retrieve discarded ballots at a condominium complex that would be used to fix an election, and attending HOA board meetings in order to intimidate board members who were not friendly with the individuals involved in the scheme. It is also alleged by a co-conspirator that he regularly witnessed HOA board members come to the office of another co-conspirator to receive cash payments. A total of 35 defendants have now pleaded guilty in the case, leaving the remaining defendants to stand trial on Oct. 14. The investigation into the scheme is considered to be the largest public corruption case ever brought by the Justice Department in Nevada. This case serves as an important reminder for Florida community associations about the level of involvement and vigilance that is necessary in order to help avoid becoming a victim of this type of fraud. 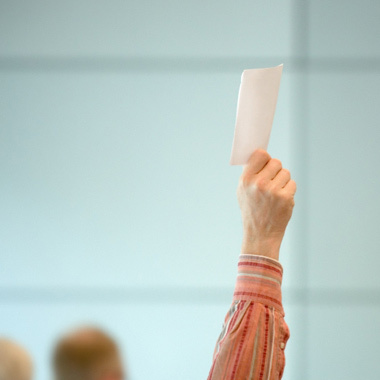 It is imperative for unit owners to monitor and participate in their association’s elections and meetings, and they should always be on alert for suspicious tactics by owners or other groups surrounding board member campaigns and elections. Owners should also ensure that they vote in all elections and submit their own ballots whenever possible, as fraudsters will typically attempt to secure and utilize ballots from those who do not normally vote in the elections or do not reside in the community or condominium. In addition, owners should determine whether their ballot was counted or disallowed at the election due to the submission of more than one ballot for their unit. If association members believe that suspicious political activity has taken place and the integrity of their board of directors and their election has been compromised as part of a conspiracy to commit fraud, they should consult with highly experienced legal counsel in order to discuss and determine their next steps. Election recalls, court appointed receivers, and injunctive relief precluding boards from awarding contracts to conspiring vendors are among the measures that can be pursued in order to correct or avoid injustices that may have occurred or may be in the works. Additionally, experienced community association legal representation may aid in processes related to criminal investigations by state and federal law enforcement agencies in such cases.